Get out your slow cooker and make a batch of tender pulled pork. 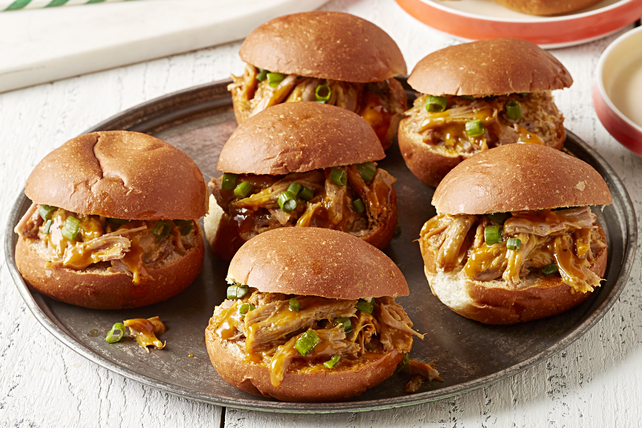 Our Hickory BBQ Pulled Pork Sliders are easy to pull together and they're sure to please a crowd. Spoon meat mixture onto bottom halves of buns just before serving; sprinkle with onions. Cover with tops of buns. Serve with a side salad tossed with your favourite Kraft Dressing to round out the meal. When serving adults, substitute 1 bottle (341 mL) beer for the water if desired.